Why Choose an Automatic Under Vehicle Inspection System? Inspecting under a vehicle with an automatic under vehicle inspection system is necessary these days. If you’re unfamiliar with our Automatic Under Vehicle System (AUVIS), you may be unfamiliar with why you would need such technology. After all, your security personnel is knowledgeable and efficient and you’ve become accustomed to placing your trust in them. Your military base or security checkpoint already feels secure, but the reality is there’s a huge factor of security you’re missing out on. 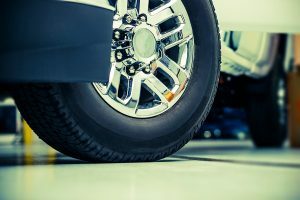 Utilizing an automatic under vehicle inspection system is a no brainer in today’s security climate for a variety of reasons. While you may be confident in the abilities of your security personnel, the fact is that manual inspection requires a vast amount of knowledge and training. It’s hard to be aware of what each make and model of cars are meant to look like and thus it can be difficult to notice anything out of the ordinary. On top of that, there’s always a margin of error when we talk about manual inspection. Ordinarily, that margin of error is an acceptable issue we can accept, but in the case of security, taking risks is both avoidable and unacceptable. Utilizing an automatic under vehicle system to scan the undercarriages of vehicles for you is the only way to be certain that you have all of your bases covered. Quality security systems these days are all about flexibility. We offer our AUVIS in either the mobile GKR-1011 model or the permanent installation of the GKR-2011. This allows for different installations depending on your needs. Either model is able to quickly scan a vehicle’s undercarriage using mobile bidirectional scanners to identify the make and model of a vehicle, detect whatever foreign objects or modifications may exist, and highlight them for your personnel to recognize. Using an automatic under vehicle inspection system means that you can set it up for however you need it. Now more than ever, we need to adequately respond to the reality that is terror threats. It’s shockingly easy to affix an improvised explosive device on the undercarriage of a vehicle and send it on its way–and while it isn’t something we see every day, the mere fact that it exists as a possibility necessitates technologies like an automatic under vehicle inspection system. The AUVIS is designed to keep you safe and secure and is meant to help in the battle against terrorism and crime. This entry was posted on Thursday, July 20th, 2017 at 12:05 pm. Both comments and pings are currently closed.